Preheat oven to 350°. Lightly coat a springform pan with cooking spray. In a medium bowl, combine almonds, 2 tablespoons sugar and melted butter. Place almond mixture in the bottom of springform pan and press down to form a crust. Bake for 5 minutes, allow to cool slightly. Reduce oven temperature to 300°. In a stand mixer bowl or a medium bowl using a hand mixer, whisk cream cheese, softened butter, eggs, ¼ cup sugar and ¼ cup corn starch, whisk until just combined. In a small bowl, combine raspberry preserves and 2 tablespoons corn starch. Pour half of cream cheese mixture into springform pan, drizzle with half of raspberry mixture. Sprinkle with half of semi-sweet morsels. Repeat to create second layer. To create a marbled appearance, drag a toothpick through the raspberry mixture. Wrap bottom of springform pan in aluminum foil and 2 inches up the sides of the pan. Place springform pan into a roasting pan filled with 1 inch of hot water. Bake in oven for 55 minutes or until center of the cheesecake is set. Turn oven off and leave cheesecake in oven for 30 minutes. Remove from oven and allow to cool for 30 minutes in pan before transferring to refrigerator, chill for 2 hours. 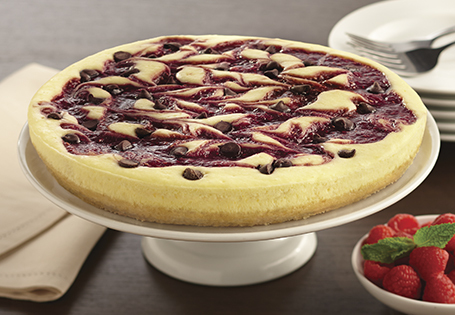 To serve: Remove cheesecake from refrigerator and use a thin knife to go around the edges of the springform pan. Remove ring from pan and slice cheesecake. Serve with whipped cream. TIP: If you like a less tart cheesecake, reduce raspberry preserves to ¼ cup and reduce corn starch by 2 teaspoons. Drizzle raspberry preserves on top and reduce cooking time by 15 minutes. You can also mix and match milk chocolate, semi-sweet and white chocolate morsels to taste.